New obsession alert!! As I mentioned on a previous post; I have seasonal color obsessions. And I seriously don’t know where the come from. It happens so fast; I wake up one day and all of a sudden I want everything in that color. I know it doesn’t make any sense, but very deep inside, I try to convince myself that it does. This “season” I’ve been loving the anything in that dusty pink color. Now, luckily for me, Pantone just name Rose Quartz one of the colors for 2016. So we will be seeing this color A LOT throughout the year. or if its just that it so happens that I am a bow-loving type of person. Which I wasn’t a couple of weeks ago, believe me. 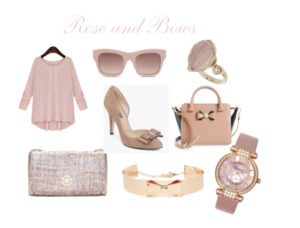 I just feel like a bow can make any piece look classic and very feminine, and I’m okay with that. Here is a list of a couple of things that are on my current wish list and that are obviously rose and have bows on it. Alerta de nueva obsesión! Como mencione en un entrada anterior, tengo obsesiones temporales con los colores. Y en serio no se de donde salen. Sucede tan rápido; me levanto un día y de repente quiero todo de cierto color. Yo se que no tiene sentido, pero muy en el fondo, intento convencerme a mi misma que si tiene sentido. Así que esta “temporada” he estado amando todo lo que sea de color rosa viejo. Ahora para mi suerte, Pantone acaba de anunciar que el color Rose Quartz sera uno de los colores del 2016. Así que estaremos viendo MUCHO de este color durante el año. He estado viendo mucho Gossip Girl en Netflix últimamente y no se si es el hecho de que Blair Waldorf y su grupito han estado inculcando su estilo de moda en mi subconsciente o si simplemente es el hecho de que me he convertido en una persona amante de los lazos. Lo cual no era hace unas cuanta semanas, creanme. Siento como que un lazo puede hacer que cualquier pieza se vea clásica y femenina, y me gusta eso. Aqui arriba les dejo una lista de unas cuantas cosas que han estado en mi lista de deseos y que, obviamente, son de color rosa y tienen lazos. That color is one gorgeous color and I can't wait to see more of it in Spring! Rose Quartz is such a gorgeous colour. I am glad it is the colour of 2016. I am loving bow again but it is only because I have been watching gossip girl Netflix. Blair pair up her so well with her outfit, that everything look so classic and chic!